Over the course of more than forty years of drum making, Boston's George B. Stone & Son offered different levels of products at varying price points aimed at a wide range of buyers. One market in which Stone & Son did a great deal of business was the school market as evidenced by this advertisement announcing "Stone Drums for the School." The ad is undated, but came enclosed in a copy of Catalog K which included a price list dated September, 1928. The single page flyer describes three economically priced "Colonial" models which "are made in our own factory" and "are far superior to the average drums offered at higher prices elsewhere." This likely meant that the Colonial model shells were single ply maple with solid maple reinforcing rings - the style most commonly used by Stone on nearly all of their drums, a notable exception being the famed Master-Model Drums which featured 5/8" thick, three ply shells. The artwork seen above was in fact recycled from earlier Stone catalogs. That explains why the Colonial Orchestra Snare Drum and Colonial Military Snare Drum are advertised here as being equipped with the "long model snare strainer" though the pictures clearly depict drums outfitted with the Stone Patent Snare Strainer and Muffler designed by William F. McIntosh. 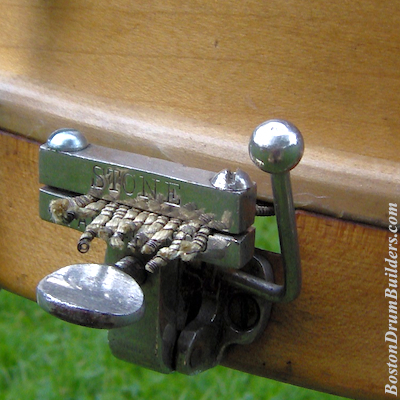 Stone's Colonial models were single tension drums which used simple thumbrods and claws to adjust both drumheads simultaneously. This was at a time when separate tension drums had long since become widely accepted as the professional standard. 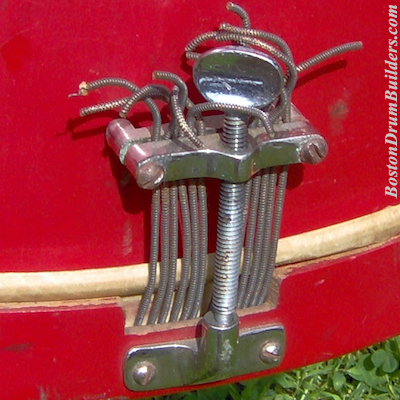 Another distinguishing characteristic of Stone's lower end drums including the Colonial drums is the absence of a badge or makers mark on the exterior of the drum. Stone certainly didn't want these beginner level instruments to be mistaken for professional level drums. 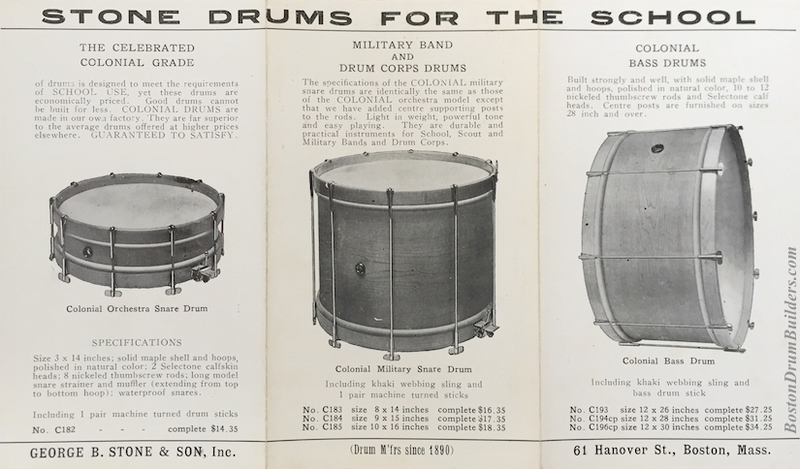 The Colonial drums were part of a long succession of budget level drums offered by Stone & Son. 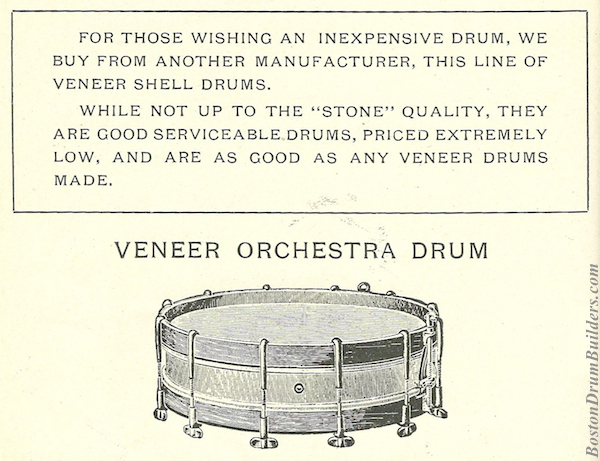 Among the comparable lines offered by Stone at other points in time were the "Victory" model drums, which appeared in Catalog I (1919) and the 1922 Supplement, and the "Veneer Drums" of the mid 1910s which were last included in Catalog H (ca. 1915). It should be noted that unlike the Colonial drums of the late 1920s, the earlier Victory models were likely assembled using components sourced elsewhere. The Veneer drums were not made by Stone at all but were instead purchased from another maker altogether. The inclusion of these lower end models in Stone catalogs is accompanied by language distancing Stone & Son from the quality of the product to some degree. In the case of the Victory models, Stone Catalog I states "In answer to a widespread demand for an inexpensive drum we offer the VICTORY line of medium grade drums which, although not up to the Stone quality, are good serviceable instruments for orchestra, band and drum corps." The earlier Veneer drums carry an even stronger disclaimer in Catalog H announcing "For those wishing an inexpensive drum, we buy from another manufacturer, this line of veneer shell drums. While not up to the "Stone" quality, they are good serviceable drums, priced extremely low, and are as good as any veneer drums made." All of this is to say that Stone making the entry level Colonial model drums in house during the late 1920s was noteworthy because it indicated a shift in Geo. B. Stone & Son's business strategy to move away from professional level drums and more towards catering to school bands and the drum corps markets, a mission advanced by Stone's own Drum School. The move away from high end drum manufacturing proved to be a trend through the 1930s as the Great Depression took its toll, talking movies was killed off the theater musician, and the industry generally passed Stone by. Do you have an instrument labeled Geo. B. Stone & Son? I would love to hear about it! Drop Lee a note at lee@vinson.net. And for more on George B. Stone & Son and the other early 20th century drum makers of Boston, Massachusetts, please visit BostonDrumBuilders.com.